Ikoku Meiro no Croisée 11 ~ did you just cast a spell on me? This episode was even more visually appealing than usual. I think, in part, it was because there were a lot of outdoor scenes. 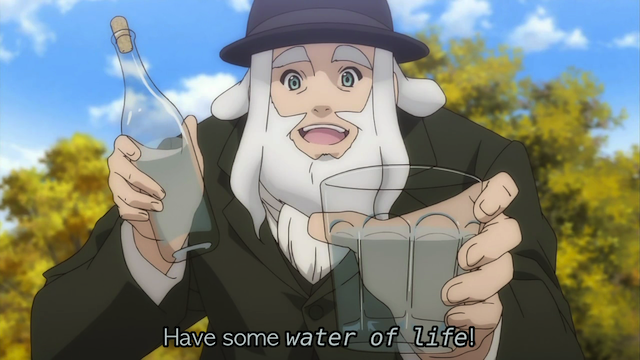 Episode 11 of Ikoku Meiro no Croisée (Crossings in a foreign labyrinth) dealt with magic and prayer as ways of digging into Yune’s sad past, and suggesting possible directions for the end of the show. It was also full of beautiful imagery, so I found myself screen capping even more than usual. Alice is still under the delusion that the whole world revolves around her. 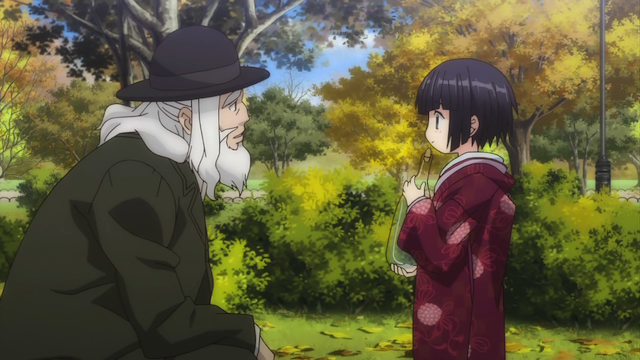 She wants to take Yune to the Gran Magazin, but Yune won't go until Claude returns, so she can ask permission. Alice promptly throws a fit. 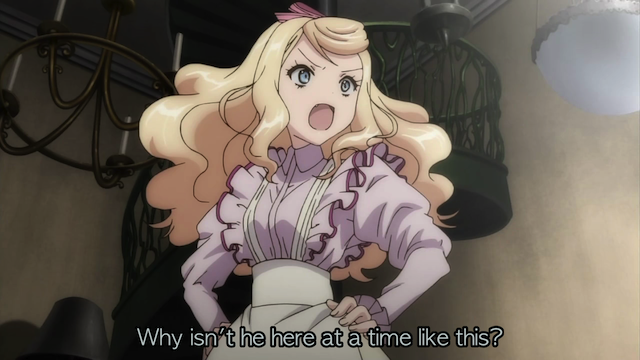 Unfortunately, when Claude returns, he absolutely forbids Yune to go shopping at the Galerie's "enemy". 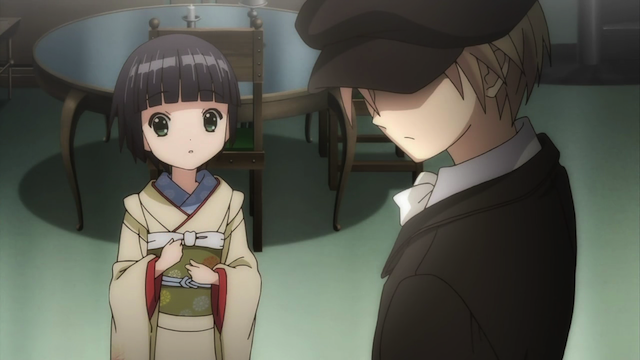 Yune realizes there is a deeper pain at the root of Claude's reaction. 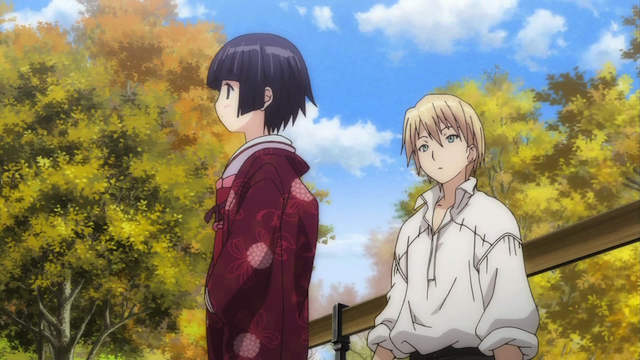 Knowing that Claude isn’t ready to open up to Yune about his feelings, Oscar suggests that he should consider asking Yune about hers, which Claude rejects. Feeling bad for having acted selfishly, Claude suggests a picnic lunch, together with Oscar. The three head off to the park despite a rainy start to the day, under the protection of Oscar’s magic. Oscar gives Yune some wine to go with her lunch. In fact, she seemed to enjoy the wine a bit too much! (Note: see Luftritter’s comment below about the alcoholic beverage). 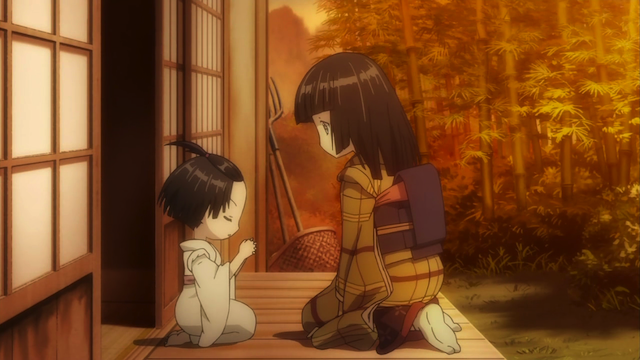 In her inebriated state, Yune gets nostalgic, and talks incoherently about her sister, Shione. After a brief nap, she seems better, but is still somewhat emotional. Hearing a church bell ring, Yune gets up and starts to pray. When Claude asks her about it, she says she is praying for her sister's health. Yune starts crying unexpectedly, and Claude decides that he needs to pry into Yune’s past, because he sees that there is something that is troubling her. Unexpectedly, Yune tells Claude and Oscar that she is ashamed because her sister’s poor health, and blindness are the results of a selfish wish that Yune made. 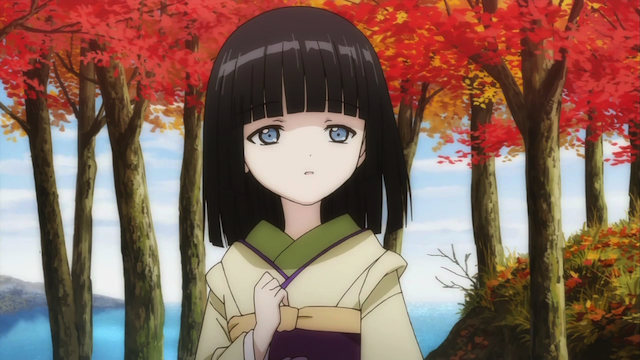 Shione, Yune's sister, has light-colored eyes (rare in Japan), so strangers considered her creepy, and an ill omen. 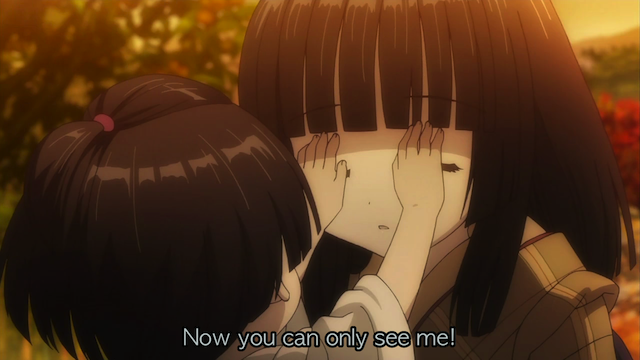 When she realizes that her sister is bothered by the reaction people have to seeing her eyes, a very young Yune casts a magic spell. The warm tones are suggestive of a beautiful Japanese garden on a Fall evening, and also general nostalgia, and the sense of closeness of the two sisters. An innocent act that will haunt Yune for years. At first the sisters play that Shione is blind. Thus she keeps her eyes shut around strangers. Since they don't see her eyes, Yune's "magic" works well -- the only one who sees them is Yune, who thinks they are beautiful. 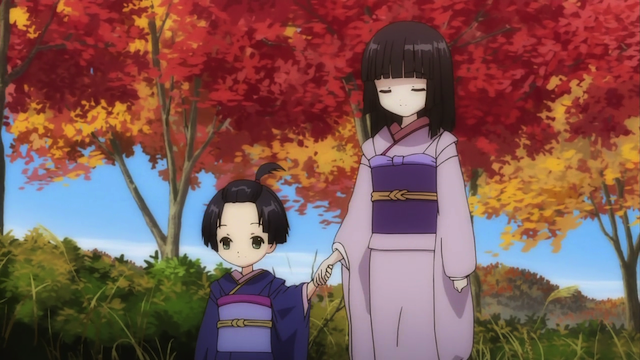 Previously we have mostly seen Yune’s memories from Japan as being taken care of when she was ill by her sister. She had been quite sickly, but gradually grew healthier. Unfortunately the reverse happened to Shione, who became more frail, and whose eyesight failed. Yune believes she “stole” her sister’s health and eyesight. Shione acknowledges that she is losing her eyesight for real. I love this scene -- again the colors are wonderful! The blue of the sea, and the vibrant red of the maples, and the very delicate colors of Shione's skin, eyes and kimono. 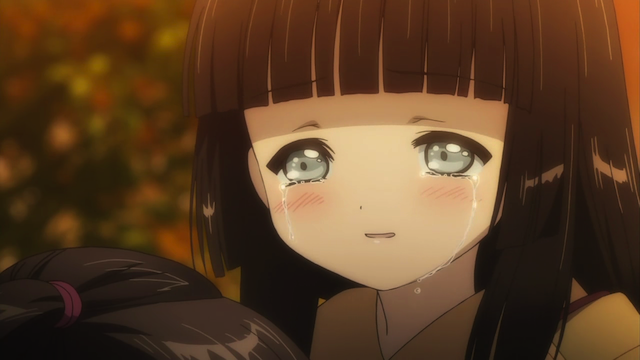 Yune breaks into tears again. Claude tries to comfort her by telling her it was a coincidence, but to no avail. It is up to Oscar’s magic to make Yune feel better. 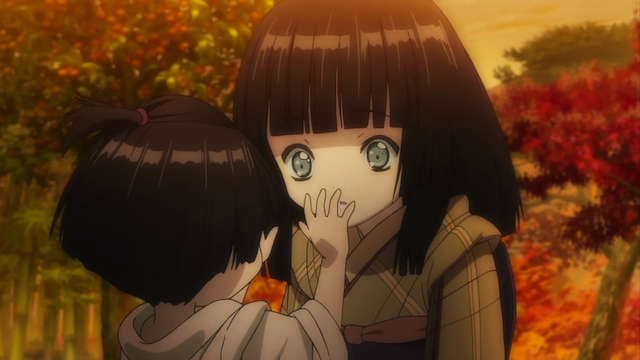 Oscar cheers up Yune by making her understand that her loving presence was a great comfort to her older sister, who had previously had to bear the condemnation of others alone. After a bit more crying Yune is happy again, but Oscar’s work isn’t finished. He tries to get Claude to realize that his claims of not caring about the “trivia” of Yune’s life isn’t really a noble act, as he likes to pretend, but cowardice. 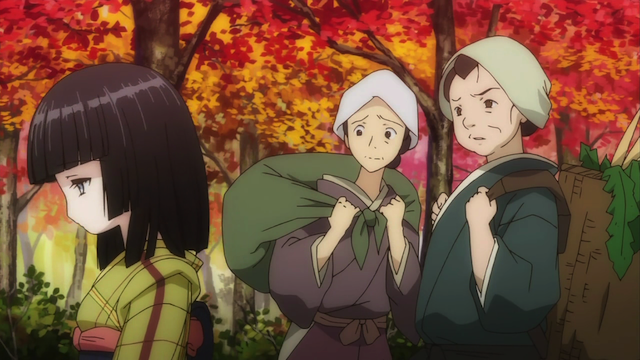 Claude doesn’t want to get too close to Yune, because he is afraid it will only hurt more when she leaves. Aside from the substance of this week’s story, there was a strong feeling that we were being prepared for the ending. Is it related to the painful memories of his father that prevent Claude from accepting the Gran Magazin? His feelings for Camille? Perhaps his feelings of being abandoned by both his father and Camille are the source of his inability to open up to Yune, and she finally manages to heal his heart so that he can be open with people again? Perhaps the final episode regards Yune’s departure back to Japan? This certainly was a lovely episode. 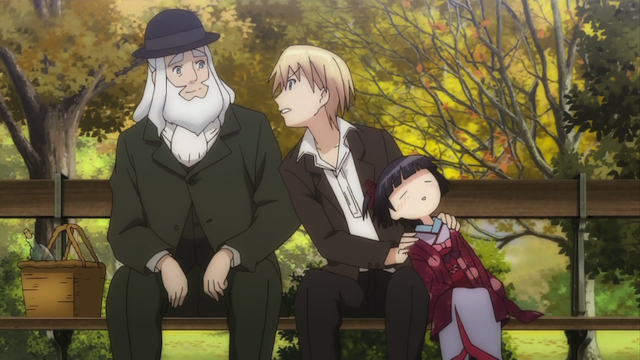 It had its humorous moments, but kept its focus on Yune, in a way we haven’t seen since the beginning of the series. Aah, well. All good things must come to an end someday. It was visually a lovely episode, and a I’ve been wondering about why Yune is in France at all almost since de beginning of the story. Looking forward for the answer. “eau-de-vie”: Aah. Interesting. I’ve never tried that. Of course Yune is so tiny that it perhaps make sense. 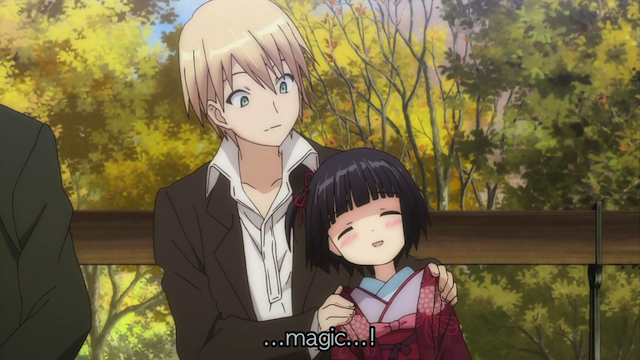 I thought it was interesting that Claude referred to her as a kid in this episode.